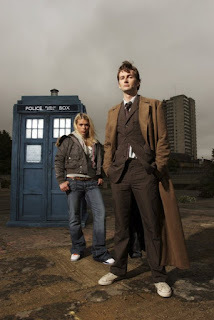 Cool - well this is my first ever blog, and I thought I would write it about making my latest replica of the coat worn by David Tennant in Doctor Who. I think from the first publicity photo that showed him in the coat, I was taken with its style and lines. It is such a striking, long and flamboyant coat I just had to have one! The first coat I had was one a lot of people got, made by Honest Dragon through their eBay listing. 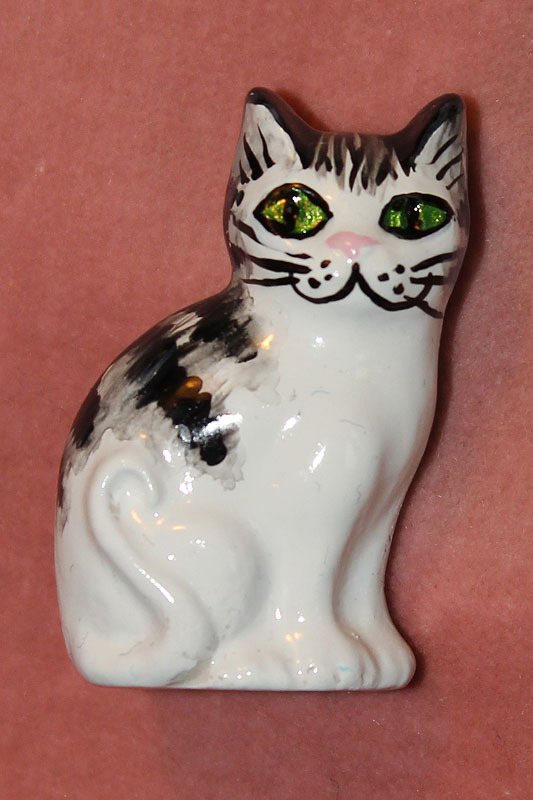 It was cheap - chearful - and not very accurate: the cut was all wrong and the colour was too pale. I had a winge at them and got them to remake it using a darker material, but when that arrived it was worse that the first. They had used some dark brown fabric which stank of tar! It smelt like a newly laid road - there was no way I could wear it! So I decided to set about making my own. 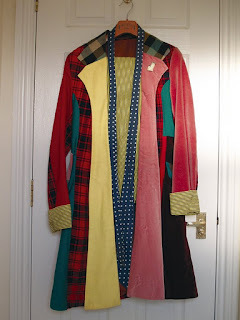 I had made a replica of the coat worn by Colin Baker when he was Doctor Who and I was 19 years old in college. I still have it today and I think it stands up well. Everyone who has seen it has always been very impressed. I had no training in tailoring, but had been using my Mum's old Singer sewing machine for years, making little fun projects and puppets over the years, but this had been my first serious attempt at making something substantial. I think the challenge I enjoyed the most was finding all the right fabrics. Back then there were a LOT more independently run fabric shops around. I lived in Edgware, North West London and I had at least two in my immediate local area, a couple down in Burnt Oak, several in central Harrow and Wealdstone - so they were all within a short bus ride. 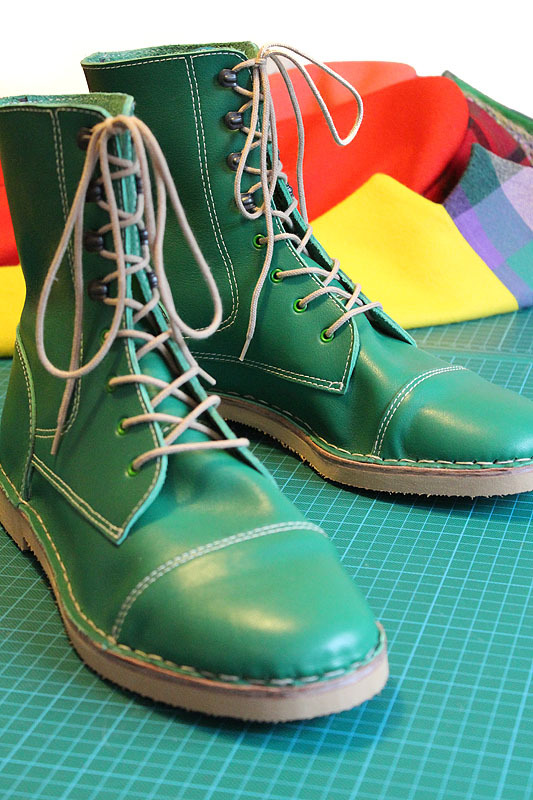 I would spend Saturday morning trawling their bolts of fabric, finding the best matches I could. Then there was John Lewis. Almost then enitre ground floor was given over to habadashary and fabrics. They were always a good bet as a starting point for something a little special. Now most if not all of the shops are closed, and John Lewis is all perfumes and menswear, with a tiny department on the third floor for fabrics. Anyway, I enjoyed wearing it at the time, but it has laid hidden away in the back of my wardrobe ever since. So I knew I could do it . . . . it was just how . 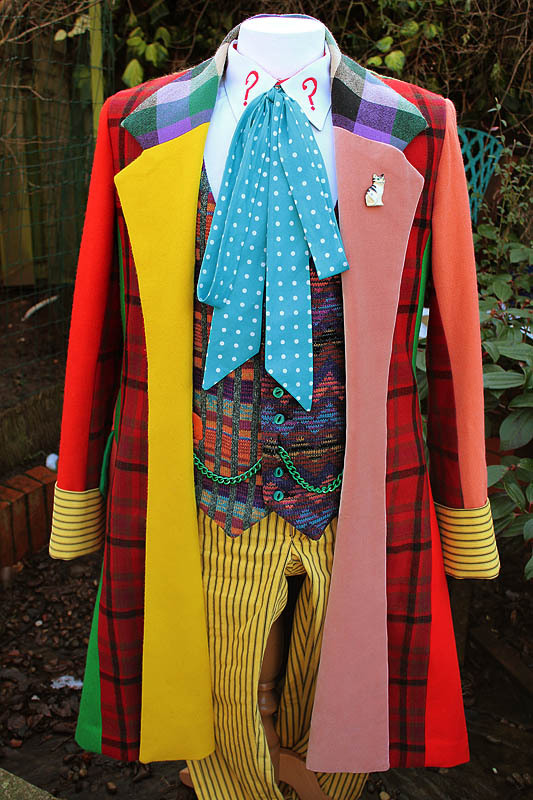 . . . .
that colin baker coat is amazing are you interested in selling it??? 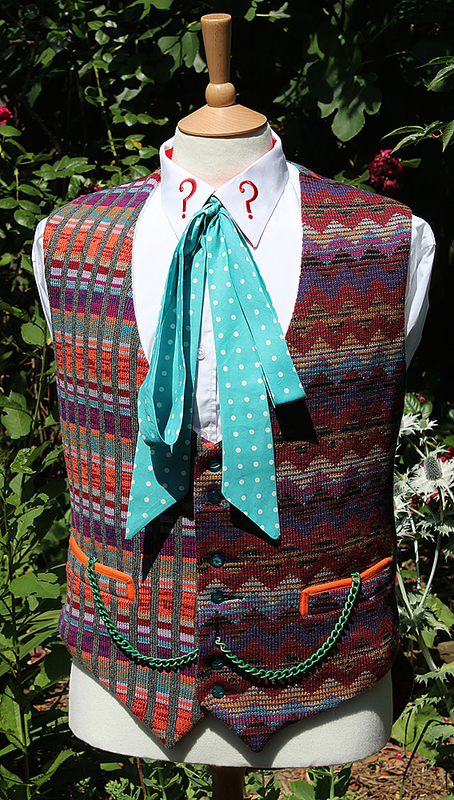 Thanks for your interest in that Colin Baker coat of mine. It is probably a little deceptive, but the coat is actually around a chest 34, as I was when I made it in 1984 or so. It has not weathered well, and some of the fabrics are now somewhat worn and not what they were. My technique at the time was almost nonexistent with the pockets poorly executed and only one of the sleeve-heads being any cop - and that only by pure luck at the time. Besides, the coat has enormous personally sentimental value and I could never think about parting with it. I might, however, at some future time, revisit the fabric hunt of finding the materials needed to remake it and maybe next time around I will do it to a better standard.